It is an interesting fact that garage door extension springs are actually more extensively used for commercial systems. Still, many residential overhead doors are equipped with them as well. These components are responsible for holding the unit in place when it is in closed position and for facilitating the opening process. They are set above the left and right horizontal tracks respectively. In fact, each one of them is attached to a specially designed bolt which is fastened to the angle iron holding the horizontal track in place. The other end of the spring is attached to a pulley. This is done with the use of a special component called pulley fork. The lift cable goes over this pulley and over another one and then down to the bottom of the door where it is secured firmly. When the door is in closed position, the springs are stretched (extended) and hold a large amount of energy. This amount matches the weight of the door. In this way, these hardware components actually hold the entire door in place. During opening, the springs contract and release this energy. It is applied to the pulleys and then to the cables which actually take the door up. 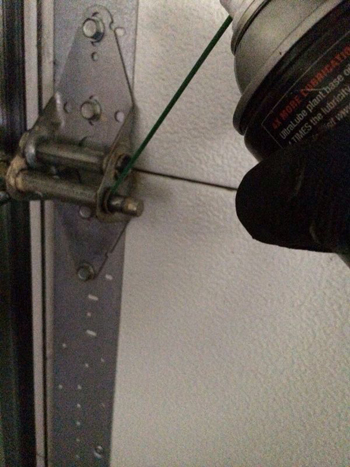 The garage door extension springs actually do the hard work when it comes to opening the door. The role of the opener is much smaller. Given the great amount of tension that these components are under and the great load of work that they do, they can wear over time and use, and will break eventually. When they break, the energy that they hold is released. The safety cables which run through the springs are responsible for preventing the pieces from shooting across the garage.